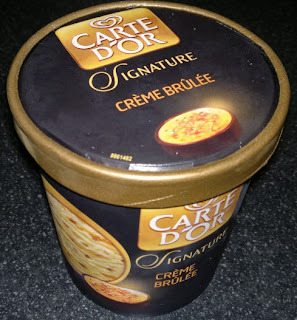 Regular readers of this blog (poor you) will be aware that I am a bit of a fan of ice cream. You may also have noticed mentions in passing that I'm partial to crème brûlée. So imagine the general yayness I felt on seeing this stuff on sale. I mean, crème brûlée ice cream – what's not to like? 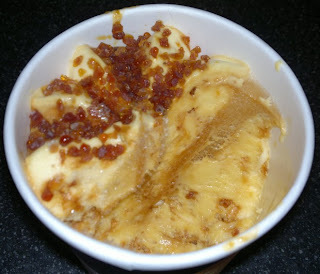 Well, there is a layer of burnt – sorry, caramelised – sugar on top, and the flavour of the dessert is fairly CB-like. But the texture is an utter disappointment: it's basically just foam. It barely registers in the mouth at all. And there are interesting-looking layers and swirls within the ice cream, but these prove to be the same stuff, just a different shade of beige. Totally unremarkable, I'm afraid.